Want to know one of my favourite favourite things to eat? While I adore oysters (preferably with champagne) from time to time, my current addiction is a bit less sophisticated. Yep. I love, love, love me some peanut butter. Mostly straight from the jar on a spoon. Yum. So when one of my Instagram friends posted a photo of her peanut butter granola, I just had to get myself into the kitchen and make my own low-carb / gluten-free version. It took a few goes to get the peanut butter intensity right, but I persevered. I know. The things I do just for you. I like it to use as a crunchy topping for a bowl of natural unsweetened yoghurt and berries for a quick breakfast. But it’s also great as a dessert with lashings of double cream or ice cream. With or without fresh fruit or a drizzle of melted chocolate. You could also add some sea salt flakes and serve it as a snack to have with drinks. In our house we go through at least a jar of peanut butter a week. So it’s a huge understatement to say that we LOVE it. Especially Pics from New Zealand. 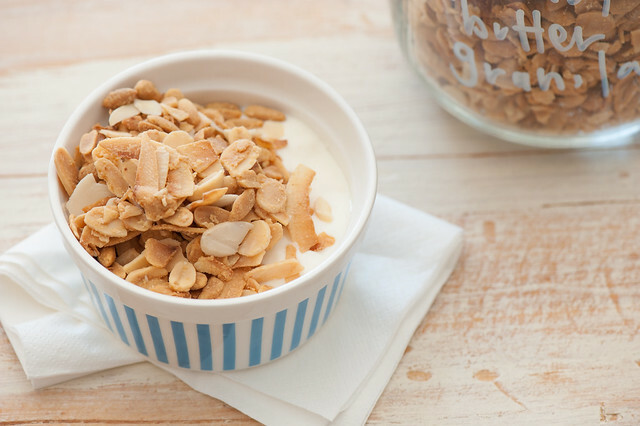 While we happily eat is straight from the jar on a spoon, we also love it in this super crunchy granola. This is one of those rare cases where I find smooth peanut butter works slightly better than crunchy. Although if you’ve only got crunchy in the house, it will be good too. And I should note the peanut butter seems to slow down the browning process without slowing down the roasted flavours. So it can get over-roasted quite quickly. I tend to pull it out before the colour is as brown as I would normally let it get to be on the safe side. 1. Preheat your oven to 150C (300F). Melt butter or coconut oil in a small saucepan. Remove from the heat and stir in the peanut butter. 2. Place coconut flakes, peanuts and almonds in a large mixing bowl. Drizzle over the peanut butter mixture. Toss until the everything is coated in the peanut butter goodness. 3. Line a large baking tray with baking paper. Spread over the nut mixture into an even layer. 4. Bake for 15-30 minutes, stirring every 10 minutes until the granola is golden brown or slightly darker. Cool on the tray before storing in an airtight container in the pantry. vegan / dairy-free – use coconut oil. traditional granola – if you’re OK with carbs and gluten replace some of the coconut with rolled oats. chocolate granola – try the recipe over here. different nuts – feel free to replace some or all of the peanuts with other chopped nuts. no coconut – I use coconut flakes because they’re inexpensive compared to other nuts and lighten the texture but you could just use more flaked almonds or other nuts if you aren’t into coconut. sweeter – I like to keep it on the more savoury side but feel free to add a little stevia, honey or maple syrup to the melted butter mixture. snacky – toss in sea salt flakes and serve with drinks. ps. ‘Early Bird’ registration for ‘A Simple Year’ ENDS THIS WEEK!. If you’re interested in learning how to simplify not just healthy eating, but the whole of your life, then I recommend checking out A Simple Year. 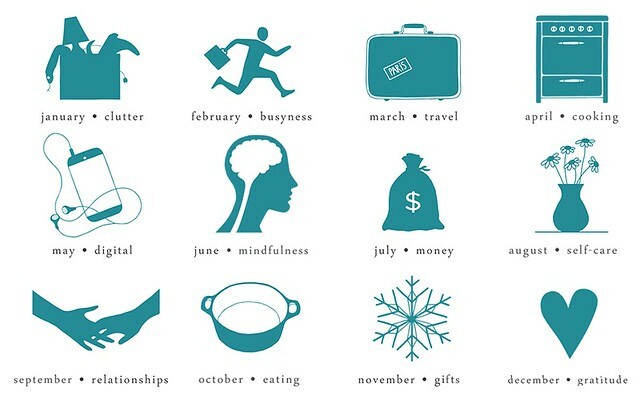 It’s a 12 month program which focuses on simplifying a different area of your life each month. If you join us I’ll show you how to simplify not only your approach to healthy eating but also your kitchen and your cooking. NOTE: ‘Early Bird’ discount on registration ends 13th November. I LOVE peanut butter too. I make your hummus recipe from your template collection with peanut butter instead of tahini. Peanut butter I use is natural with no sugar. I use some sirrach sauce in my hummus too to work with the peanut butter. YUM! 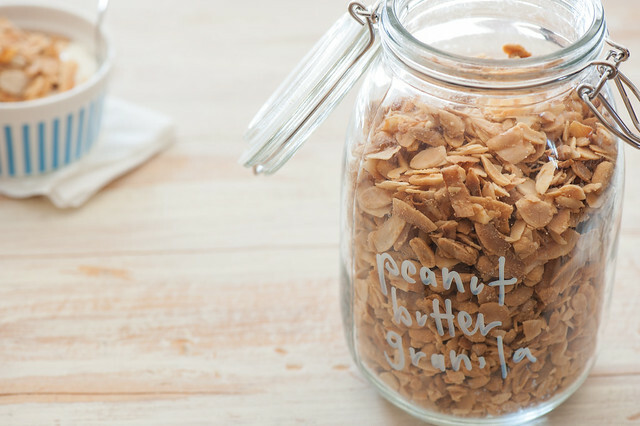 Create more peanut butter recipes! Yay for peanut butter Randall! I’ve tried it in hummus too… and thought it needed something else… will have to try with sirracha. Love it! Jules would this be ok to add too my breakfast menu i have just started reclaim your waist line ?